Approximately 2 percent of adults and 6 percent of children have a food allergy, according to the FamilyDoctor.org website. Any food can trigger an allergic reaction, including a lemon. Symptoms of a lemon allergy can occur within minutes after contact with the fruit or can take up to two hours to manifest. An allergy to lemons can be dangerous if left untreated. Talk to your doctor if you experience allergy symptoms. Although it's rare, you might experience itching, swelling, redness, blisters, bumpiness and dryness of the skin after touching a lemon. More commonly, itching of the mouth, tightness of the throat, coughing or a metallic taste in the mouth can develop after ingesting lemon. Gastrointestinal side effects can include nausea, vomiting and diarrhea. In some cases, temporary sensitivity to the sun can occur after coming into contact with lemon. A food allergy develops when the immune system mistakes the proteins called profilins in lemons as dangerous. As a result, the immune system releases histamine and antibodies into the blood to fight off the profilin, which triggers the symptoms of an allergic reaction. Besides the lemon itself, the wax and dye that is sometimes applied to the lemon peel can also trigger an allergic reaction. Consult a dermatologist or doctor if you develop an allergic reaction after eating or touching a lemon. A doctor can perform patch or skin prick tests to positively identify the allergen. Avoid contact with lemons and all products that contain lemons, such as drink mixes and skin products. Wear gloves to protect your hands if you must handle lemons. Apply an over-the-counter emollient cream to help soothe skin irritation and redness. Your doctor can also prescribe oral or topical steroids to treat allergy symptoms. 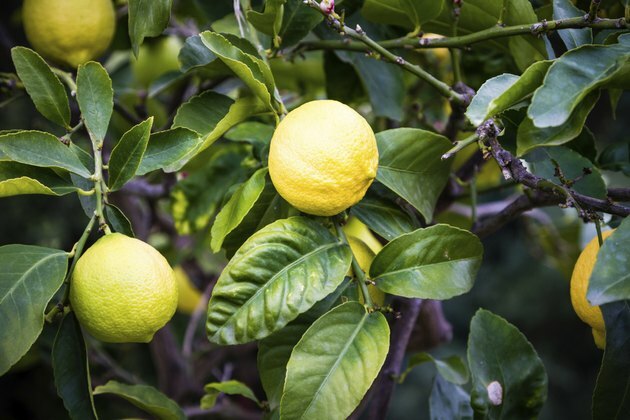 If your allergy to lemons is severe, it can lead to a reaction called anaphylaxis, which causes the airways to tighten and can make it difficult or impossible for you to breathe. In addition, you may experience wheezing, chest tightness, dizziness and difficulty swallowing. Immediately go to the emergency room if you experience anaphylaxis after touching or consuming lemon. A doctor may have you carry an epinephrine self-injection pen with you at all times if you are diagnosed with a lemon allergy. How Many Calories Does a Lemon Have? What Is the Benefit of Eating Whole Fresh Lemons? Can Eating Too Many Lemons Be Harmful?